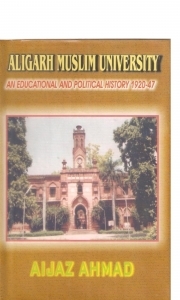 Description of "Aligarh Muslim University (eBook)"
This book entitled “Aligarh Muslim University: An Educational and Political History, 1920-47” is a complete history of Aligarh Muslim University right from its establishment to the Indian Independence of 1947. The content of this book throws light on educational development of AMU and political participation of its alumni into the ongoing national movement of that time. The chapters of this book also mentions that how the alumni was divided into loyalist and nationalist factions on the question of Pakistan Movement. Dr. Aijaz Ahmad was born on 16th August, 1969, at Motipur village in Sant Kabir Nagar district of Uttar Pradesh. After completing his early education in Basti, he took admission in AMU Aligarh in 1985 for higher studies and completed B.A. (Hons), M.A. and M.Phil. in History. He also qualified NET and JRF test conducted by UGC. In 2000, he obtained his Ph.D. degree as a teacher candidate from Jamia Millia Islamia. In 1994, he was appointed as a lecturer in History in YMD College Nuh in Mewat District of Haryana. New Delhi. Now he is working as Associate Professor in History department of the same college. In his service career in the same college he got published nine research papers in national and international journals and proceedings of the Indian History Congress. He has also got published four books titled “Aligarh Muslim University: An Educational and Political History, 1920-47”, “Mewat: A Retrospective”, “Indian Muslims Against British Rule” and “Uprising of 1857”. Reviews of "Aligarh Muslim University (eBook)"